This entry was posted in Food Glorious Food and tagged bob marley, canning, frugal, how to make, jammin', making jam, nectarine jam, peach punch jam, preserving, preserving the season by cityhippyfarmgirl. Bookmark the permalink. I’m planning on making some blueberry jam. Any tips? The blueberries are great at the moment aren’t they. Love them. I did this blueberry jam back at the start of the year if that’s any help to you Zara? I sometimes get delightful visions of your kitchen at home, and today is definitely one of those days 🙂 The aroma, the taste testing, the sticky packing up…it makes a delightful scene in my mind, even if my imaginings are a tad off accurate! I love these flavour ideas too, they’re both new concepts to me as jam options. If you are picturing a small kitchen, with a Monkey or two grappling a leg as well, it could just be right Kari… and always the sticky packing up! I got home today and had my first mango of the season, followed by a peach – excellent reasons to be home. I have never made jam, but this doesn’t look too difficult. That’s a good way to start getting home Debra. Cherries next? It looks beautiful. Any reason there is no rum with the nectarines? Do they have less pectin? Also, do you take the skin off when chopping or scoop it out during cooking? No reason for the nectarines to be rum-less, just thought it would go a bit better with the peaches. Thanks for the skin question too- I had forgotten to write that (now edited.) For the peaches I skinned them beforehand. The nectarine jam no, though any obvious skins that rise to the top I do scoop out. That would be the result of part frugality and part laziness Johanna 🙂 Scrubbing labels off just wasn’t doing it for me, now there are none. I just write what it is on the top. Wow, you’ve been busy, busy! Two x 2kg batches of fruit equals a LOT of jam! I’ve been jammin today too…raspberries..but just under a kilo though. 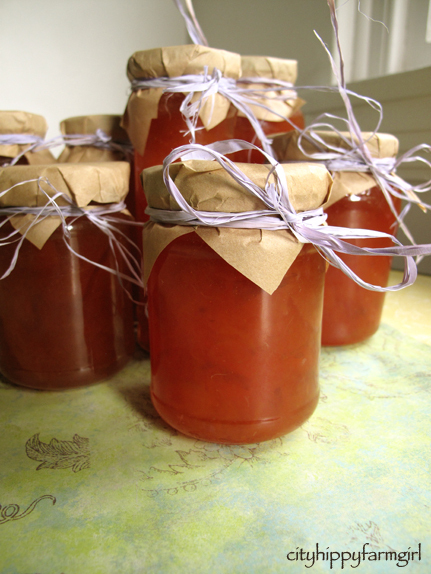 I’d love to try a nice boozy apricot jam soon though..just waiting for the prices to come down to my liking. A litre of water sounds like a lot…did it take long to reach setting point? Jams are so pretty held up to the light..especially your jams! It’s been cooler weather here the past week (like a balmy winter!) so it seemed a good time for jammin’…plus the fruit was available. The litre does sound a lot doesn’t it, it could easily be lessened for a quicker cook, (although it didn’t look so much when it all went in). Maybe an hour it took to set?? Nectarines are lovely this time of year aren’t they. One of my favourite fruits. Beautiful looking jars of jam … love the Bob Marely reference haha. Oh, I’m so envious that you’re enjoying stone fruit season … peaches are my favourite and I haven’t eaten one in many years. I’d send you a box if I could… years is far too long without having had one. Label scrubber here. Have discovered that if you soak them in cold water they come off easier, hot water seems to set the glue. Having said that, some labels are put on with airplane glue I am convinced of it. Turn your lights down low…. Jam on ! Some labels are fine, but the airplane glue/wood glue/soldering iron type ones that take days to convince they don’t need to be there…phew! Oh how fun! I love jams and the simpler the better. Jam shouldn’t be complicated, save that for making Timpano’s! Ha ha! I had a jammin’ (We’re Jammin’) session and post in July…our summer…as well! 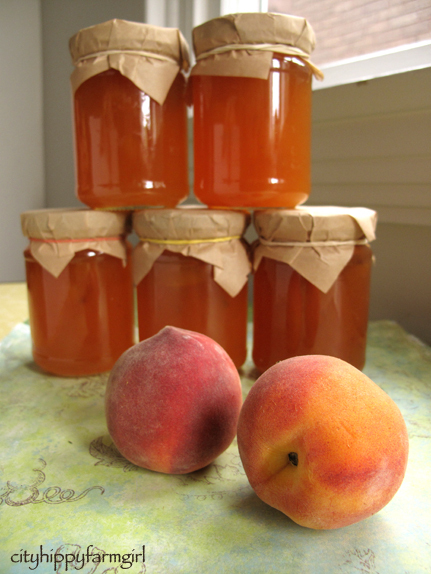 You can’t beat homemade jams for gifts and I especially like the look of your peach punch jam with the rum in it…will have to try it next peach season here…in the N. Hemisphere! Pretty jars, too. It was either rum in a fruit cake or rum in the jam, seeing as though I didn’t have any of the ingredients for the cake… the jam got it! the light shining through those jars of jam gladdens my heart..and a dollop on a piece of toast would surely gladden anyones taste buds..
How inspiring. Its been ages since I have had a chance to log on to your blog and to discover so much. Lots of stuff to fill our tummies, and your full tummy. Congratulations on the tummies and the blog! Kate from Brisbane. I was thinking of you just the other day Kate…it’s been too long! I like the sound of the rum! Nice finishing off with the brown paper and raffia. It is summer in a jar isn’t it. Done Mariana. If we lived in the same street, I could be your preserving apprentice and a little jammin’ business would be ridiculously fun. Why does Australia have to be so big?! True to typical Aussie weather, I’m sure a 35C day is just around the corner…just not sure which corner. I’m sure these will be much appreciated gifts. I hope so Karen, otherwise we have a whole lot of jam to get through! I love homemade jam and yours looks wonderful. Love the way you have presented the jam in the jars too. Love seeing all your summer fruit- not envying all the canning labor. I made cookies all week for a wedding and now I want to cozy up to a fire with a good book! I’m sold! I’ve never made peach jam, so I guess this is the year all that changes. What a perfect Xmas gift, too. Lovely jars of jam. I’m waiting patiently for the figs to ripen in Autumn (and maybe the wildlife will leave me some this year – wretched microbats!) and I’m finally going to bottle figs in port wine again. Oh dear we aren’t allowed to call it port now….ummm fortified wine :). Tip for removing reluctant labels – a bottle of eucalyptus oil and some cotton balls to rub it on with. Give the label a good dab of oil, leave for about 10 mins and you should be able to peel off the label. The ‘airplane’ glue ones sometimes take 2 goes as the labels seem to be in a top and bottom layer. Apologies! Footnote to above – has to be 100% pure essential eucalyptus oil not the diluted stuff. I love the name of your blog and your very fine photography (I have 40 years of amateur photography backing that up, so it’s a serious compliment!). I have just started a massive undertaking, a hippie movement history site, and am intrigued by your characterization of yourself. I’d love to hear about your hippie influences, where they came from, and what you think of my first few blog posts and “About” pages. I do intend to write on organic/local foods as one of the hippie movement’s lasting positive legacies. Any direct connections you know of between present local growers and sellers and true hippie roots might provide some useful source material if you could make an introduction. Love and peace, the anonymous hippie curator of Thank A Hippie! Hello, just wondering how long your jam stores for, and what kind of conditions you store it in? Thank you! Hi this is my first time to making jam. I want firstly thank you for making it easy for me to make jam. I have always stayed away from making jams because I thought mine would flop. My question is the bubbles at the top while boiling ? must these bubbles be scraped off and the sides of the pot kept clean ?